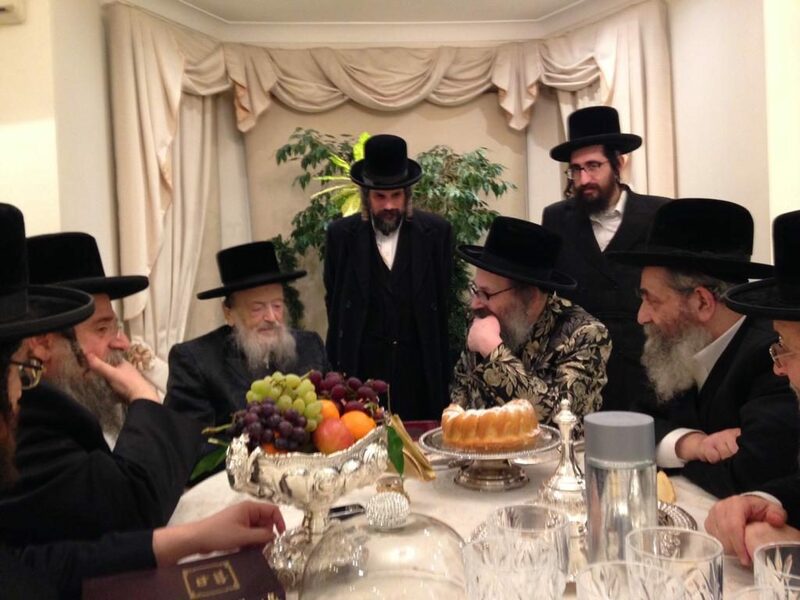 The last photo of the Liezher Rav, zt”l (L), together with the Vizhnitzer Rebbe, shlita, of London (C) and his son-in-law Harav Chaim Michoel Biberfeld, Tchortkover Rav of London, shlita. The London community, and Klal Yisrael as a whole, mourns the petirah of Harav Yehoshua Ze’ev Meizlish, the Liezher Rav of London, zt”l, who was niftar on Shabbos in London. He was 87 at his petirah. He was the son of Harav Chaim Meizlish, the Sarvosher Rav, zt”l, who was the son of Harav Dovid Dov Meizlish, zt”l, the Ujhel Rav and mechaber of Binyan Dovid. As a young boy during the war years, Rav Meizlish survived the horrors of the Holocaust, and later became a close talmid and devoted Chassid of the Satmar Rebbe, Harav Yoel Teitelbaum, zy”a. When he came of age, he married, tblch”t, the daughter of the Liezher Rav of London, and after the passing of his father-in-law, he was appointed Rav of the beis medrash. He was noted for his shiurim and fiery drashos, and many acts of tzedakah and chessed. Over the last year, he was hospitalized several times. At the beginning of Shevat, the Rav was hospitalized in a difficult situation, with many davening for his refuah. On Shabbos, his soul was returned to its Maker. He is survived by, yblch”t, his Rebbetzin, who stood at his side over the years; his sons Harav Shlomo, Rav of Chevras Shas; Harav Heinich Mordechai, Rav of Toltchova in Kiryas Yoel; Harav Moshe, Radvaner Rav of London; and Harav Yaakov Yitzchak Elazar, Rav of Beis Medrash Avodas Halev in Yerushalayim. His daughters are married to Harav Asher Anshil Jungreis, the Chenger Rav; Harav Shmuel Ludmir, Rav of Pressburg in London; Harav Chaim Michoel Biberfeld, Tchortkover Rav of London; and Harav Benzion Halberstam of Lakewood. The Rav is also survived by many grandchildren and great-grandchildren, following his illustrious ways. His levayah was held on Motzoei Shabbos, from his beis medrash in Stamford Hill, London, to the Enfield cemetery.